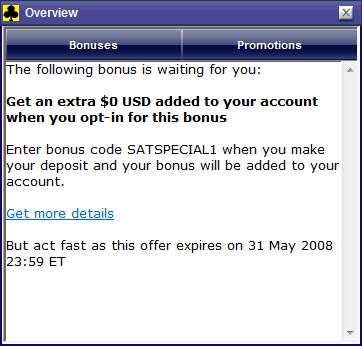 When I logged in to Empire Poker today, I had the following fabulous bonus offer waiting for me. I had to double-check so I clicked to get more details. It confirmed the same deal. The release requirements for a $0 bonus? One raked hand apparently. I think I’ll probably not bother with this one.